Acana Wild Prairie dog food is made with the highest quality ingredients including fresh free-range chicken eggs and wild-caught white fish. Acana dog food is grain-free containing no rice or maize and is easily digested. High in Omega 3 from wild fish protein from fresh meat and Natural glucosomine and chondroitin. 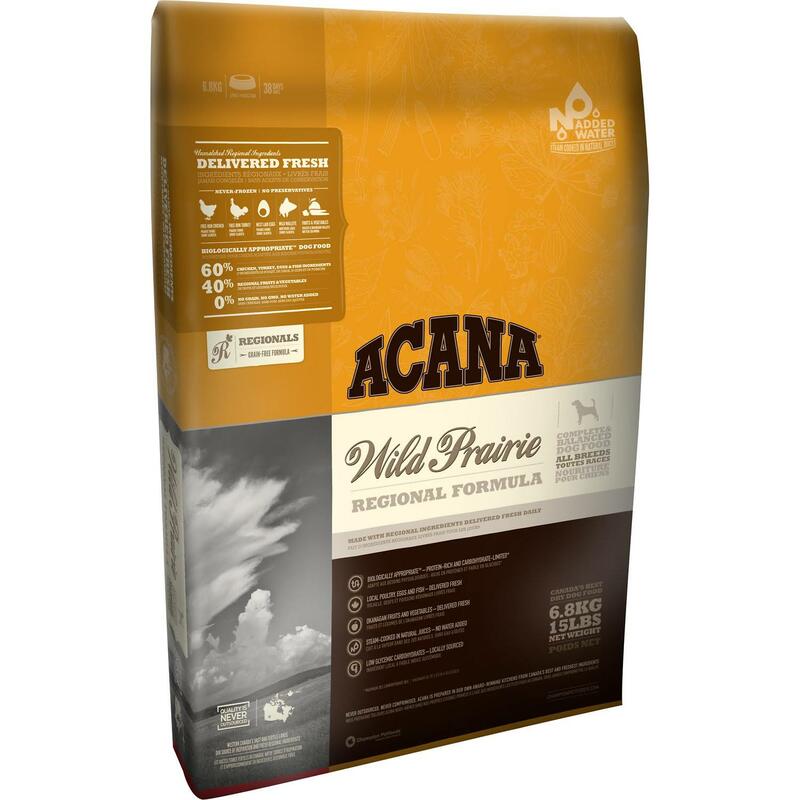 Acana Wild Prairie supports healthy skin coat and joints in your dog. Free of antibiotics and hormones the free-run chicken is grain-fed on local prairie farms and passed fit for human consumption before being delivered fresh - never frozen and with no preservatives. Caught wild from the northern lakes of Canada Lake -the Whitefish in Acana Wild Prairie is a member of the salmon family and contains more omega-3 fatty acids than pink salmon and three times more than any trout. Native to Western Canada, Northern Walleye is wild-caught from the cold northern lakes of Alberta and Saskatchewan and delivered fresh. Noted for its lean nutrient-rich flesh the Walleye in Acana dog food is an excellent source of easily digested protein. Canada Grade A eggs are delivered fresh (never frozen) from Alberta's Prairie Farms. Acana Wild Prairie dog food is one of the highest quality foods on sale in the UK today. Buy Acana with free delivery at Big Dog World. Deboned chicken; chicken meal; green peas; turkey meal; chicken liver oil; ﬁeld beans; red lentils; deboned turkey; whole egg; deboned walleye; sun-cured alfalfa; pea ﬁbre; chicken liver; herring oil; apples; pears; pumpkin; butternut squash; parsnips; carrots; spinach greens; cranberries; blueberries; kelp; chicory root; juniper berries; angelica root; marigold ﬂowers; sweet fennel; peppermint leaf; lavender; rosemary.